Qualified, competent, and committed staff are central to the success of protected areas. Training of protected area staff is more and more recognized as a vital component of efficient protected area management. These guidelines aim to present the lessons learned and good practices accumulated in the ever-expanding field of protected area training. 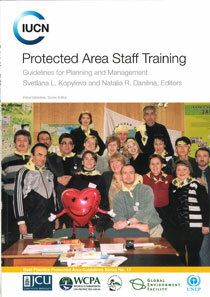 Many of the examples are from North Eurasia, drawing on the results of a GEF/UNEP project “Strengthening the network of training centres for protected area managers in Northern Eurasia,” but the publication also includes case studies from around the world and universally applicable principles and methodologies for planning effective and innovative protected area staff training.